“Act of Violence” explores the choices one makes creating the sometimes thin line between being a hero and an informer. Frank Enley (Van Heflin) is a war hero, maybe. He has a beautiful wife, (a young fresh faced, Janet Leigh), a young boy, a thriving business, a house in the California suburbs and is well respected in the business community. He goes on weekend fishing trips with his neighbor while the wives are happily at home. Into this tranquil and serene world comes Joe Parkson (Robert Ryan), a limping, gun carrying, revenge seeking former army buddy who is dead set on killing Frank. Parkson is sinister looking, seething with hate. Joe cannot forget or forgive what happened back when they were prisoners of war in a Nazi stalag camp. Frank was the highest ranking prisoner in the German P.O.W. camp. He and Joe were also good friends until Joe and a group of other P.O.W.’s planned an escape, via a supposed secret tunnel. Frank pleaded with Joe not to do it, telling him the Germans knew about the tunnel making the plan too dangerous, they would never make it and would all be killed. He tries to persuade the others not to go on with the planned escape. They don’t or won’t listen. Frank decides to go to the camp’s commander, telling them about the escape plan, extracting a promise from him; they will go easy on the escapees. On the night of the escape, the Nazi’s go back on their word and massacre the escaping prisoners; all except for Joe who manages to survive, and escape, by playing dead, his bum leg, a lasting memory of Frank’s treasonous act. The Germans treat Frank as a hero, giving him special treatment, plenty of good food while his remaining fellow prisoners are left starving and ill treated. Frank returns home to a life of family, success and tranquility while Joe’s life has taken another road entirely, one filled with hatred and revenge. It’s eating him up. He’s got a girl, Ann (Phyllis Thaxter) who loves him and knows that he has a kind side. She does her best, continually pleading with Joe to forget about the past telling him to let’s just go home back east. But Joe cannot forget, he cannot forgive, he’s filled with rage which will only find release by killing Frank. Frank goes on the run attempting to hide from Joe but Joe keeps tracking him down. Then one night in a drunken stupor, Frank connects with an over the hill tramp named Pat (Mary Astor) and a shady punk named Johnny (Berry Kroeger) who squeezes some dough from the hung over Frank as payment for Johnny to bump off Joe. The next morning Frank realizes what he agreed too and heads out the find the place Johnny has duped Joe into showing up, thinking Frank will be there, unaware of Johnny’s own plan to kill him. The climax comes in the final scenes with Frank’s redemption, costing him his life, but saving Joe’s. Director Fred Zinnemann and screenwriter Robert L. Richards weave a story filled with complex and moral issues of right, wrong, guilt and betrayal. Frank survived and has done well since the war ended with both family and career. Still, it has taken its toll on him; so much so, he is no longer sure why he informed. Wasn’t he just trying to save his men in a fool hearted attempt, trusting the Nazi’s to do the right thing, or did he really betray his own men, sacrifice lives to extract favors for himself and damning his fellow prisoners to hell. I love the script of this movie, the complexity of it. The two main characters are fully realized. No one is all good or all bad. Frank’s motive for informing always remains uncertain. It’s easy to say, “The guy squealed and was a traitor” but how sure are we of his original motive? We don’t know, and at this point in his life, years after the war, he is no longer sure why he did it. Whatever his reason, his actions changed the lives of many though the prisoners involved in the escape were mostly doomed either way. Then again, we are never sure the Nazi’s knew about the escape plans until Frank told them. Robert Ryan is never anything but perfect as the revenge seeking ex-soldier. After all, who plays disgruntled better than Ryan? If you need an actor with a chip on his shoulder, Robert Ryan is your man. Van Heflin is Mr. Nice Guy who is hiding his dark secrets from the world that is from everyone but Ryan. Conflicted, trying to hold on to his life, Van Heflin gives a strong sensitive portrayal of a man whose life is quickly spiraling out of control. A young, still dark blonde haired, Janet Leigh is Van Heflin’s sweet wife, a role with not much meat on it. A few years later Leigh would appear in another noir classic, Orson Welles “Touch of Evil.” Phyllis Thaxter handles her role as Ryan’s love interest with loving desperation. My two favorite performances in the film though are reserved for Berry Kroeger and Mary Astor. Kroeger is a perfectly slimy lowlife willing to kill for cash. Kroeger is not well known but has contributed to such films as “Gun Crazy,” Cry of the City” and “The Dark Past” as well as many, many TV shows. Mary Astor who only a few years earlier played the devilish Brigid O’Shaughnessy in John Huston’s masterpiece, “The Maltese Falcon” gave what turned out to be one of her last meaty role, as Pat, a prostitute who has seen better days. Pat, is a bit frumpy, a rough around the edges broad who knows her best days are behind her and like Johnny is looking to soak Frank for a few bucks. It’s a terrific desperate performance. 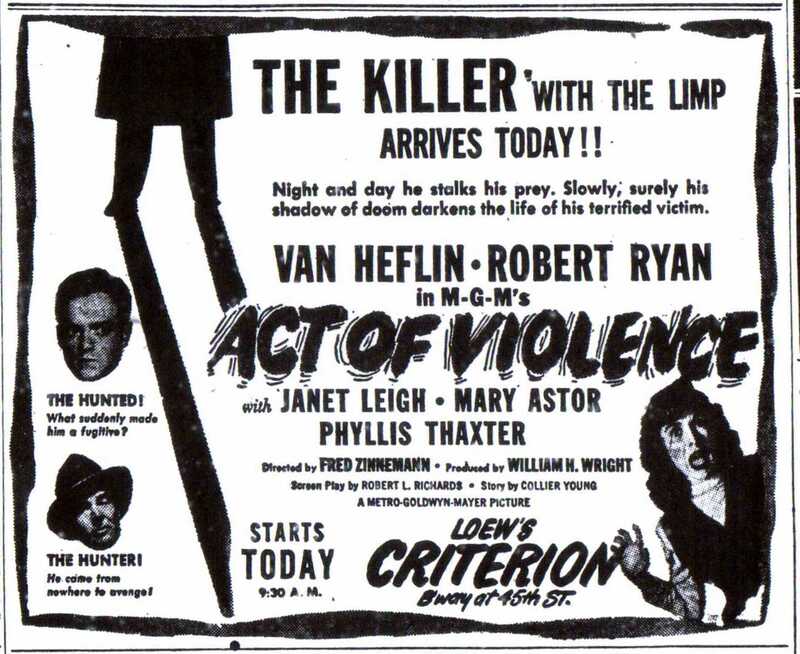 This entry was posted in 1940's, Film Noir, Film Reviews, Fred Zinnemann, Janet Leigh, Robert Ryan, Van Heflin and tagged Act of Violence, Berry Kroeger, Film Noir, Fred Zinnemann, Janet Leigh, Mary Astor, Phyllis Thaxter, Robert Ryan, Robert Surtees, Van Heflin. John, an excellent post on an early Zinneman film that should be better known. I think you do this terrific little film great justice with your sympathetic review of it. His films lack the disctinctive stylistic touches of an auteur director, causing him to be looked down on by many critics. But I find him an accomplished craftsman and reliable director of compelling if not always exciting movies. Heflin’s not an actor I like a lot, but I think this may be his most interesting performance. He’s the nice guy he usually played but with a tortured edge. He seems to be trapped in a situation that’s the result of a questionable decision he made earlier with good intentions but whose consequences were taken out of his control. This situation of being trapped in circumstances he’s both responsible and not responsible for, of being neither wholly guilty or wholly innocent, gives the film an intriguing ambiguity that really holds your interest. The hit he arranges in a moment of weakness almost replicates the bad decision he made earlier and now regrets. Mary Astor is very sympathetic as the washed-up prostitute, my favorite of her post-“Maltese Falcon”/”The Great Lie” performances. Glad that you mentioned cinematographer Surtees, one of the best and a real master of b&w. I recall how well Zinneman used certain locations in this film. I particularly remember the Craftsman-style house Heflin and Leigh live in, Angel’s Flight in L.A. that was used in so many noirs like “Kiss Me Deadly,” and the scenes at the lake. I thought Van Heflin did a fine job as the tormented Frank grappling with his survivor guilt, but Robert Ryan really blew me away with his yearning for vengeance, while nevertheless being so much more than a neo-bogey man terrorizing Frank. Admittedly, I may be a tad biased because my dear late mom was a big fan of Robert Ryan, and her enthusiasm rubbed off on me when I was a teen. 🙂 Excellent review, my friend! I like that Dorian! For an MGM film this was definitely on the dark side. I don’t think anyone other than film freaks know the difference in studio styles, but for those of us that do this film comes as quite a surprise as it does coming from the land of Garland, Kelly and Astaire. It is definitely a terrific little film that deserves more attention. As for Ryan, I am there with you. He never gives a bad performance. Thanks, as always, for stopping by. I’ve never even heard of this film before. I really like the story premise–it is strangely original. I like the idea of a film based on previous actions in a POW camp. Great review. Think you would like this Kim. It pops up on TCM now and then and is available on DVD. Yes, the concept is interesting and the filmmakers do a nice job here. I’ve always liked Fred Zinnemann’s films and I’ve read about this one but have never seen it. I know Zinnemann may not be a stylist, but he had good instincts about stories and complex themes. I’ll definitely look for this one. I agree, I am a big fan of his FROM HERE TO ETERNITY and HIGH NOON. Hope you get to see it. Thanks!!! What a brilliant noir this was. Though film noirs and fatalism usually went hand in hand, I’ve really seen very few noirs that were as fatalistic as this film. Yet, despite its existential bleakness, this was also quietness personified as silence (along with the sparsely used melancholic score) was used to such terrific effect to further accentuate the incredible moodiness of the storyline and the photography. I felt Cronenberg’s A History of Violence had significant thematic resemblance with this Zinnemann classic. By the way, I wasn’t aware that this is considered as part of a loosely composed trilogy – thanks for that info. Terrific review as always John!!! I am not sure if anyone ever considered it trilogy other than me. I used the term because of the World War II theme that runs through all three. There is a dark desparate feeling that runs through this film that you cannot shake off. You use the word fatalistic and I cannot think of a more appropriate word. Great comment and thanks!!! 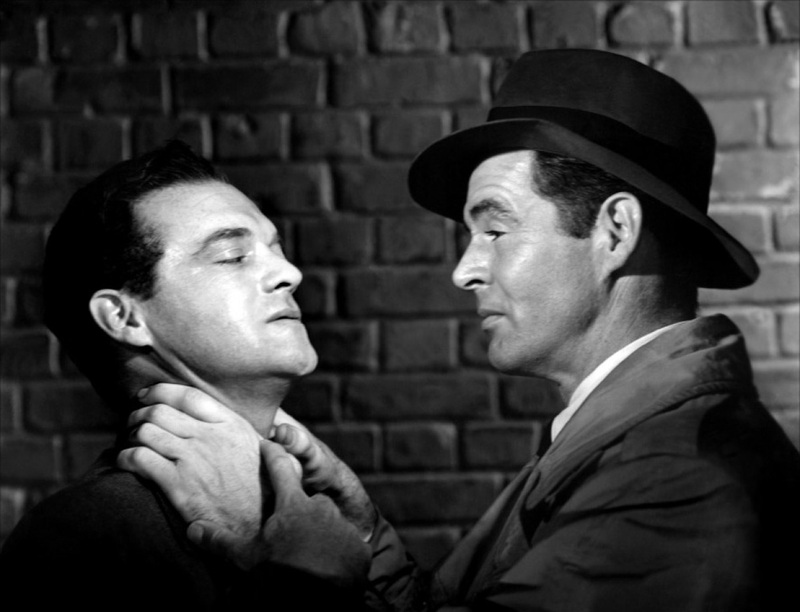 Indeed John, and you are absolutely dead-on to issue effusive praise for this very underrated and relatively unknown noir thriller that showcases yet another stupendous turn from Robert Ryan. I saw this recently at the Robert Ryan Film Festival and I found myself nodding my head to every excellent point you make in this utterly engaging appraisal. I agree that Astor was marvelous too, and as you rightly note Van Heflin delivers a sensitive portrayal. There are elements of Orson Welles THE STRANGER in this story and teh film is taut, well-observed and skillfully directed by Zinnemann, and atmospherically photographed by Robert Surtees. Golden Age composer Bronislau Kaper contributes a textured score as well. 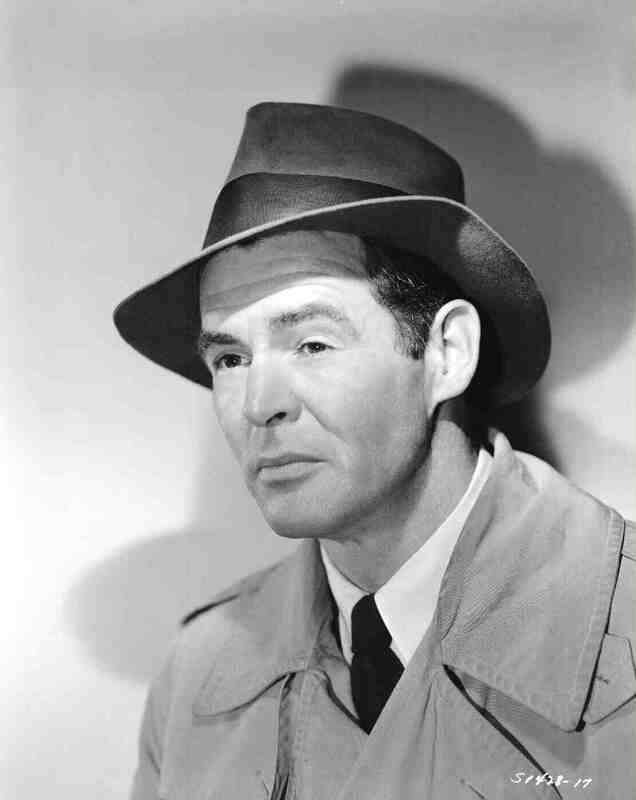 Wish I could have been there for the Robert Ryan festival at the Film Forum. What a magificent list of films and performances, one excellent one after another. I admire this film more and more with each viewing. John – Much insight on a fascinating film. I saw “Act of Violence” for the first time just a year or so ago and was surprised I hadn’t heard more about it. 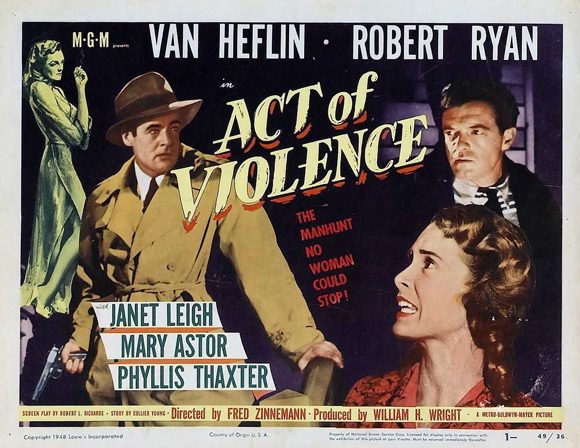 Many fine performances (I can’t resist either Robert Ryan or Mary Astor), an interesting story of thought-provoking themes and an atmosphere that is so taut at times that the viewer (i.e., me) nearly breaks out in a sweat. I’ve only seen “Act of Violence” once, but after reading this piece I feel like I need to see it again. Great post! This a a very tight and tense film so I can understand you breaking out in a sweat. The tension never lets up and the characters are so well drawn. There were times I would feel sympathy for Van Heflin’s character, then other times, I wold say he is getting what he deserves. In the end he finds his redemption and Ryan’s character finds peace. 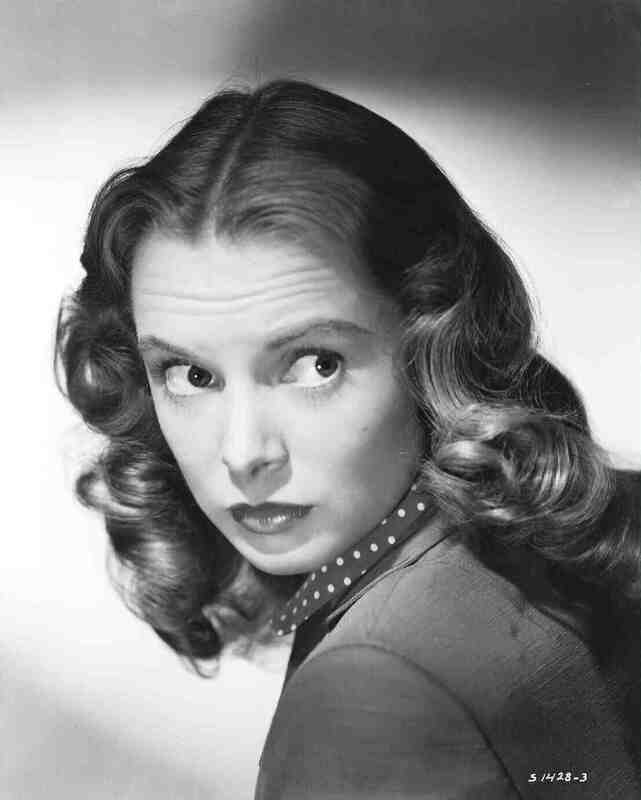 Sadly, Janet Leigh and the child lost a husband and a father. John – In the beginning I felt total sympathy for Frank and pure animosity for Joe whose rage toward Frank seemed irrational. Of course, once Frank’s secret came out, Joe’s behavior was easily understood, if not exactly supported. It would’ve been much easier for me to turn completely against Frank if he hadn’t had a family (and if Van Heflin hadn’t been the actor he was). Terrific film. True Eve, the film has the ability to make your emotions and feelings change as the story continues to unfold. Wonderful stuff!